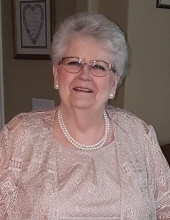 Vera was a hard worker, helping her husband with his accounting business after she retired from many years with Southwestern Bell Telephone. She was full of love, amazingly strong faith, and laughter; never missing the opportunity to joke around. She enjoyed reading, watching movies and theatre, and playing cards. But the time she cherished the most was the time spent with her family and watching her grandchildren grow. Vera is survived by her sons Anthony Kruse and wife Monica of Wichita and Michael Kruse of Lenexa; daughter Mary Rhodes and husband Dennis of Gardner; brothers Mark Thummel and wife Melinda of Plainville and Ralph Thummel and wife Wanda of Hays; sisters Elizabeth Striggow of Hill City, Rose Hardman and husband Duance of Hill City, Sister Mary Jo Thummel of Oakley, Theresa Kriley of Stockton, and May Munk of Hays; eight grandchildren, Drew Rhodes, Daniel Rhodes, Joshua Rhodes, Sarah Rhodes, Gabrielle Rhodes, Nathan Kruse, Braden Kruse, and Madelyn Kruse; and two great-grandchildren, Brilynn Rhodes and Jacob Wright. She is preceded in death by her parents John and Ruth Thummel, husband Mimi Kruse, daughter Patricia Kruse, brother Jon Thummel, sister Grace Thummel, and brothers-in-law Robert Kriley and James Munk. Our Lord Jesus told us, “If you have faith the size of a mustard seed, you will move mountains.” Greater than a mustard seed, Vera’s faith was a constant source of strength for herself, and all of her friends and family, as she daily prayed for the mountains each one of us faced. Our own lives will forever bear witness to her faith, as even now she intercedes on our behalf, to help us move the mountains we do not yet see. A Mass of Christian Burial will be held on Thursday, May 17, 2018 at 10:30 A.M. at the Sacred Heart Catholic Church in Plainville, Kansas with burial to follow in Sacred Heart Cemetery. Visitation will be Wednesday 1:00-4:00 P.M. at the funeral home and 6:00-8:00 at the Sacred Heart Catholic Church with a Vigil service at 7:00 P.M.
Memorials are suggested to Sacred Heart Catholic Church or the National Domestic Violence Hotline and may be sent in care of Plumer-Overlease Funeral Home, 320 SW 2nd, Plainville, KS 67663.